TL;DR version: Last year, I was threatened with a lawsuit over the pixel art album cover for Kind of Bloop. Despite my firm belief that I was legally in the right, I settled out of court to cut my losses. This ordeal was very nerve-wracking for me and my family, and I’ve had trouble writing about it publicly until now. Note: I posted this on Twitter and Maisel’s Facebook wall before it was deleted, but I’ll repeat it here: I understand you may have strong feelings about this issue, but please don’t harass him publicly or privately. Reasonable discussion about the case is fine; personal attacks, name-calling and abuse are not. We’re all humans here. Be cool. Still want the full story? Read on. 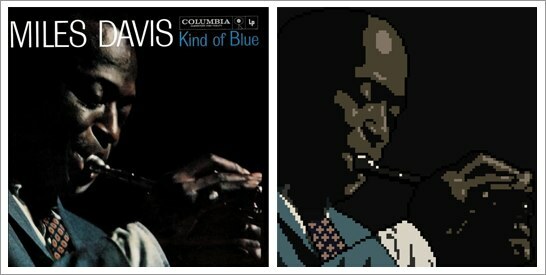 Remember Kind of Bloop, the chiptune tribute to Miles Davis’ Kind of Blue that I produced? I went out of my way to make sure the entire project was above board, licensing all the cover songs from Miles Davis’s publisher and giving the total profits from the Kickstarter fundraiser to the five musicians that participated. 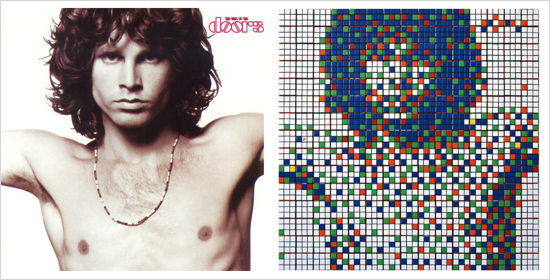 You can see the results below, with the original album cover for comparison. There are a lot of myths and misconceptions about “fair use” on the Internet. Everyone thinks they know what fair use is, but not even attorneys, judges, and juries can agree on a clear definition. The doctrine itself, first introduced in the 1976 Copyright Act, is frustratingly vague and continually being reinterpreted. The purpose and character of your use: Was the material transformed into something new or copied verbatim? Also, was it for commercial or educational use? For each case, courts take these factors into account and render a verdict, occasionally contradicting the opinions of past judges and juries. 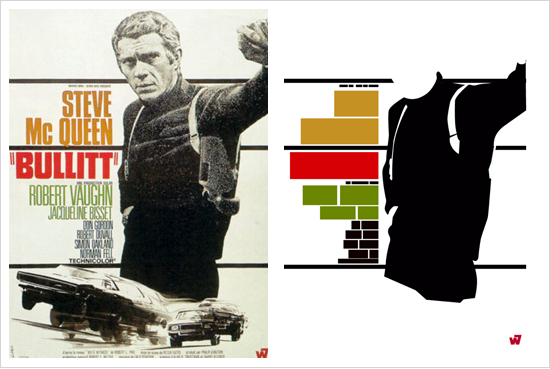 John Taylor deconstructs iconic movie posters at Film the Blanks. Many are available for sale in poster form. Similarly, the purpose of the album art was to engage both artist and viewer in the same exercise — can NES-style pixel art capture the artistic essence of the original album cover, with a fraction of the resolution and color depth of an analog photograph? It reinforced the artistic themes of the project, to convey the feel of an entire album reimagined through an 8-bit lens. Far from being a copy, the cover art comments on it and uses the photo in new ways to send a new message. I don’t think there’s any question that Kind of Bloop’s cover illustration does the same thing. Maisel disagreed. 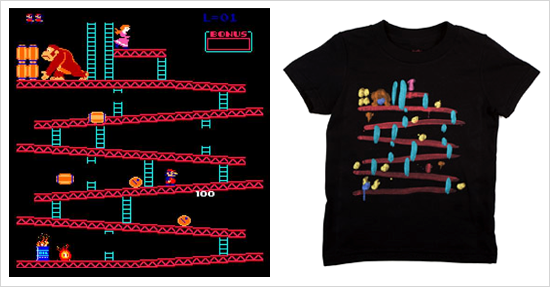 Brock Davis’s gorgeous abstract Donkey Kong from his Arcade Expressionism series, now a Threadless t-shirt. The second fair use factor is the nature of the copyrighted work. Works that are published and factual lean towards fair use, works that are unpublished and creative towards infringement. While Maisel’s photograph is creative, it’s also primarily documentary in nature and it was published long before my illustration was created. With regard to the third factor, although the illustration does represent the cover of Kind of Blue, it does so at a dramatically reduced resolution that incorporates few of the photograph’s protectable elements. Courts routinely find fair use even where the entirety of an image is used. The fourth factor considers the impact on the market value of the original work. It’s obvious the illustration isn’t a market substitute for the original: it’s a low-resolution artistic rendering in the style of 8-bit computer graphics that is, at best, of interest to a few computer enthusiasts. 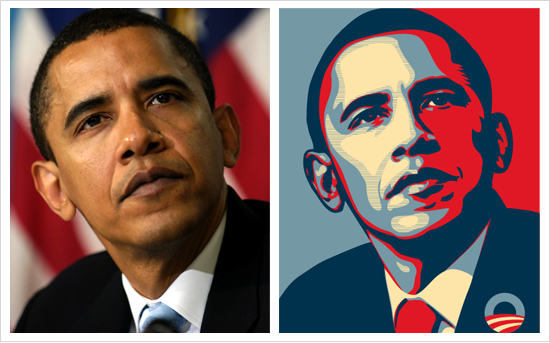 The AP sued Shepard Fairey for basing his famous Obama Hope poster on a news photo. He faked evidence in the ongoing case, damaging his fair use defense, leading to an out of court settlement. In practice, none of this matters. If you’re borrowing inspiration from any copyrighted material, even if it seems clear to you that your use is transformational, you’re in danger. If your use is commercial and/or potentially objectionable, seek permission (though there’s no guarantee it’ll be granted) or be prepared to defend yourself in court. Mike Stimpson recreates Malcolm Browne’s Pulitzer-winning 1963 photo of a Vietnamese monk’s self-immolation. It breaks my heart that a project I did for fun, on the side, and out of pure love and dedication to the source material ended up costing me so much — emotionally and financially. For me, the chilling effect is palpably real. I’ve felt irrationally skittish about publishing almost anything since this happened. But the right to discuss the case publicly was one concession I demanded, and I felt obligated to use it. I wish more people did the same — maybe we wouldn’t all feel so alone. If you feel like it, you’re still welcome to buy digital copies of Kind of Bloop (without the cover art) at kindofbloop.com. Donations can be made to the EFF, and you’ll get a rad 8-bit shirt for joining. And if you have any ideas for an alternate album cover that won’t land me in court, bring it on! Special thanks to my lawyers (Chris, Erica & Ben), the EFF, Fred von Lohmann, and the team at Kickstarter for moral support. * Kirby Ferguson’s Everything Is A Remix is a thought-provoking and entertaining demonstration of how remixing is fundamental to all creativity, with hundreds of examples from Star Wars to Apple. I’ve turned off comments, but I’d love to hear your thoughts and any more relevant examples. Send me an email or instant message, or find me on Twitter. Extra credit: Where would you draw the line?